I guess you’ll have to read on to find out…In this case, these intestines are both a trick, and a treat. Apparently I am a 5 year old boy sometimes. Like the kind that gets sheer delight out of disgusting things. This isn’t usually the case. Usually I roll my eyes at people who thin gross things are cool. Obviously they are not, they are called gross for a reason. The one exception is during Halloween when people find the most ingenious ways to make tasty food look like something it’s not. Like you’re dressing your foods up in their own disguise. A culinary Halloween costume. Love. IT. This is probably one of the many reasons why I love Halloween. It’s an excuse to indulge in everything you’re usually not. Not into gross stuff? NOW YOU ARE! Don’t like watching scary movies? NOW YOU DO! Don’t usually eat high fructose corn syrup? I BET YOU ARE RIGHT NOW! Don’t usually run with 3/4 of your bare bottom hanging out of some skimpy underpants while wearing a bra and a bolero jacket? I CAN NOW BECAUSE FOR TONIGHT ONLY THIS COUNTS AS A “COSTUME”! 1. Flour your work surface, and roll out the puff pastry. It will make your life a lot easier if you make the dough rectangle wider, trust me. 2. Cut each sheet of puff pastry into 6 equal-sized strips, cutting width-wise. Each strip should be about 3-4 inches in width, so cut accordingly. 3. 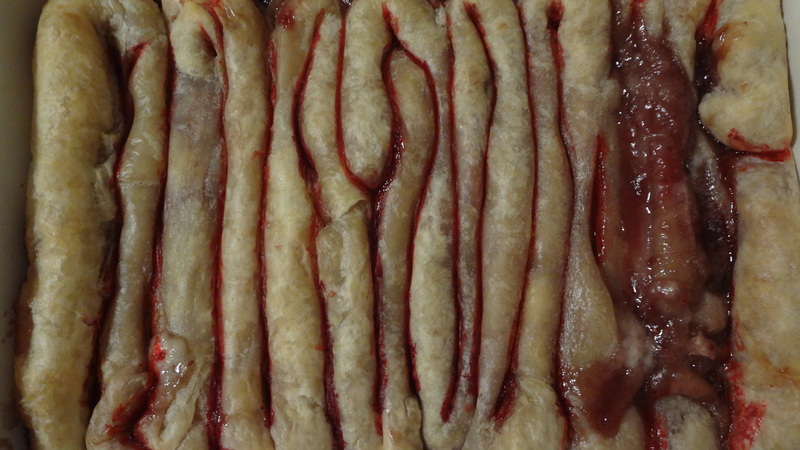 Lay your puff pastry strips down, end to end, and pinch the ends together firmly, so you have one big long strip. You can do this in segments too if you need to – I did and it worked just fine. 3. Using a small spoon or knife, smear jam down the middle of the long strip. You’ll want to leave about an inch of naked puff pastry on either side of the jam strip, because you’ll be folding this over shortly. 4. After you have your pastry jammed, cut brie slices that are about an inch wide, and 1/4 inch thick, and lay them down the middle of the pastry, on top of the jam. 5. Fold both sides of the puff pastry over the jam/brie in the center, pressing firmly to create a tight seal. When you get to either end, fold the puff pastry in on itself and seal it tight. 6. 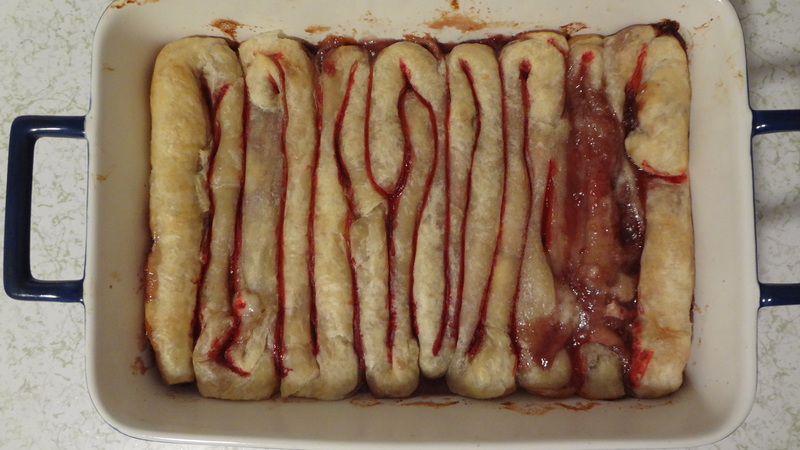 Lightly grease a 9 x 13 inch baking dish, and begin to coil your intestines into the pan. When you’ve achieved the desired pattern, bake at 350 degrees for about 20 minutes, or until the pastry is golden. 7. 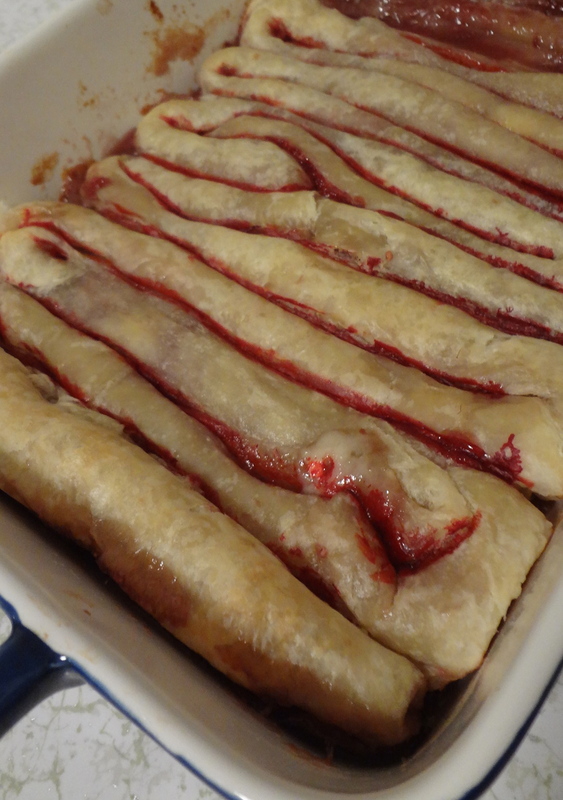 Once it’s out of the oven, let it cool slightly before dipping a brush in red food coloring, and tracing the creases between your rolls of pastry. This is give it an even more spooky intestine effect! This entry was posted in Uncategorized and tagged appetizers, Baked brie, brie and raspberry, easy party apps, gross halloween ideas, halloween baked brie, halloween party ideas, puff pastry intestines, Quick and Easy, spooky halloween food by theculinarycapers. Bookmark the permalink.